How Much Does it Cost to Paint a Room in 2019? There are several approaches to painting a room, an entire house, or apartment. The least expensive option is to do it yourself (DIY). Other options include adding some wainscoting or wallpaper, buying the materials and supplies & hiring a painter as a straight labor project, or hiring a contractor to do everything. When hiring a painting contractor, some states require a license, and others do not. Check with your city’s building inspector. They are also an excellent place to find references for particular painters and another is the Better Business Bureau. Paying upfront fees for painting is usually not a good idea, but if the contractor has good references, no more than one-third of the total. The cost of painting is mostly labor and preparation, $20 to $50 per hour. Before you decide on a DIY project, remember, it could take a lot longer. However, if you have the time, or it’s a room you don’t use every day, give it a try. The worst that can happen is you have to hire someone to finish or make repairs. You can use our paint calculator to determine how much paint you will need by first determining the square footage and then figure 350-400 square feet per gallon. A primer will cover more area than flat paint, and then semi-gloss and full-gloss usually are thicker, so they won’t cover as much area. Likewise, you might want to add in a little extra, ten percent or one quart for a small 8′ x 8′ room. Before you buy the paint, you will need to decide on your sheen: flat, eggshell or satin, semi-gloss, or full-gloss. Full-gloss is usually a little more expensive but easier to clean and has a brighter shine than semi-gloss. Typically, professional painters use semi or full-gloss on the trim or in areas that need to be easily cleaned, like the bathroom or kitchen. Flat paint will cost $25 to $60 per gallon, semi-gloss runs $35 to $100 per gallon, and full-gloss or enamel can run $35 to up to $120 per gallon. For the most part, it is a personal preference which paint you use. In addition to paint, you’ll also want to consider using primer first. 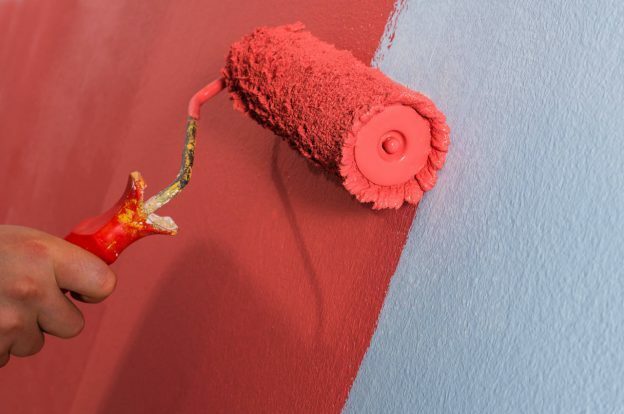 Primer will help your paint adhere better to the wall surface and aids in coverage over the previous color. There are some modern paints available with primer included. If you do choose to do a separate primer coat, a gallon of primer can cost from $20 to $50. Other supplies you will need include brushes, drop cloths, roller pans, paint trays, tape, ladders, caulking, and weatherstripping (optional). The quality of supplies will determine the speed of application, in most cases. Better quality brushes and rollers hold more paint without dripping so you won’t have to go back to the pan as often. You should figure to spend another $150 – $200 for supplies. Paint & Wallpaper, Why Choose? If you choose to use wallpaper to cover part or all of your walls and only paint the trim, you can use our wallpaper calculator to determine how much you will need for your project. There are several options for using wallpaper to break up some of the boredom caused by paint as well. Wainscoting and beadboard were initially used to protect the walls from damage but are used more as a design element now. Learn more about the cost of wainscoting. What if you have a room that some paneling, shiplap, beadboard, or wainscoting? Wainscoting usually comes up 32 to 36 inches from the floor, has a chair rail, and then the upper portion is either painted or wallpapered. The difference between wainscoting and beadboard is that wainscoting looks a picture frame, with bottom and top rails and side stiles. Some homeowners use paint or wallpaper inside the frame. Beadboard is like paneling with trim or mopboard at the bottom and chair rail at the top. Some people love the look created by wainscoting and wallpaper, while others prefer a plain color above the chair rail. Whichever you choose, it can create a stunning look for a dining room, study, kitchen, or pantry. Of course, there is a third option of using chair rail and wallpaper on the bottom and paint on the top or vice versa. If you decide to use any of these alternatives to painting the entire room, subtract the amount of wainscoting, beadboard, or wallpaper coverage from the area that needs to get painted. The average cost of hiring a contractor to paint a room when they supply everything is $400 to $800. However, some will work by the hour or charge per square foot. You can figure $1.50 to $3.00 per square foot. That price might not include extras such as caulking, weatherstripping, or preparations. Look at the contract carefully to ensure everything you want to get done is spelled out. If not, ask that it gets included. Before you begin painting, scrape off any loose paint, fill the holes, gather the supplies and paints. Alternatively, you can hire a contractor. Before you do, get a minimum of three estimates, check their references and the contract to ensure they include everything you want to get done. It usually makes sense when you paint the walls to do the trim too. Then, sit back and enjoy the bright new paint.